For 200 years, paleontologists have cataloged and named new species of dinosaurs. But it turns out the ones who named the most dinosaurs were the most likely to misinterpret their discoveries. Apparently it really is quality, not quantity, that matters. Paleontologist Michael Benton examined the work of 321 authors who named dinosaurs between 1824 and 2004. Of the roughly 1,400 named during that period, 665 of them were named by just 23 authors, each responsible for at least ten new dinosaur species names. Here's the problem - 1,400 dinosaur species were named, yes, but it turns out way less than that were actually discovered. Many of the "new" species turned out to be duplicates of previous finds, were later judged too inconclusive to identify as a new species, or were actually not dinosaur remains at all. So the real question is how many of those 665 dinosaurs did the 23 authors correctly identify. It's a pretty unimpressive percentage: just 274 of those names, about 41 percent, are still in use today. "I would have expected that more prolific, experienced authors might be better at recognizing genuinely new species, yet they were less successful than authors who name only a few dinosaurs. It is hard, and maybe impossible, to construct a case that experience in naming dinosaurs makes one better at the job." 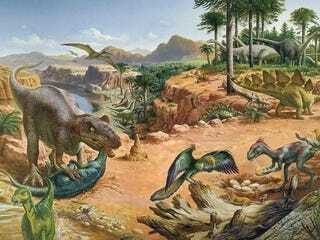 Benton expects this phenomenon is in part a reflection of the egos of the dinosaur identifiers, particularly those who worked in the less structured scientific community of the 19th century. Edward Cope and Othniel Marsh, for instance, made no secret of the fact they were competing with each other to be the "dinosaur king" of the United States, and that shows in their naming success rate. Only 36% of Marsh's 98 names are still in use, while Cope got just nine of his 64 species right, leaving him with a piffling 14% success rate, the worst of any paleontologist. Of course, the explanation isn't always quite so dramatic; often, it's a more subtle reflection of the paleontologist's overall approach. After all, some paleontologists are more likely to be "splitters", inclined to separate remains into different species on relatively little evidence, while others are "clumpers", putting as many remains in as few species as possible. In general, a splitter is more likely than a clumper to name a lot of species, and also more likely to misidentify species, because he or she is more likely to see distinctions between species that aren't really there. There's also an economic factor. Those who identified a lot of dinosaurs likely made that their sole or primary academic work, meaning they had to keep finding dinosaurs to keep their funding secure. Those who named relatively few dinosaurs likely had other research areas that provided them with grants and money, meaning they could afford to tread more carefully when they declared a new species.